One week after starting my own life in autumn 1987, a guy stopped me in the middle of the road and asked me, if I would like to jump on a waterramp. A historical question which had a big result. Hugo Bonatti, the first freestyle-pioneer of Austria, had a show in Seefeld, and announced during this show, that he was looking out for new talents. 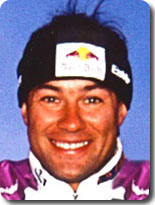 Markus Neuner, the chairman of the FREESTYLE CLUB SEEFELD, which was found two days later, could remember me as a little insane kid on skis.That was, why he asked me at the next day on the street, cause he was – like Hugo – also searching for new active members now. More for fun, than for any other reason, I jumped single flips in my first season as freestylekid, in several shows, where I improved my mental strength and self-confidence. Also a very fateful happening. Hugo became not only a very good friend of mine, he also developed to my first real teacher – forming my character by simply living his life the way he did. That was also the point where I realized, that a teacher is somebody we only choose ourself, no matter how many we should have to accept by some institutions. The first thing I learned was, that a competition has more priority than a show. A philosophy I really miss at all our rookies and generally at the youth of today. In 1988 I competed in my first competition – Nationals. The spirit of “fly” was born !!! In 1989 I competed in my first international competition. A FIS – Europacup in Altenmarkt (AUT), which I tried to forget very sucsessfully – so I can´t remember a result.